Rails-to-Trails Conservancy (RTC) has been transforming unused rail corridors into public places for running, biking, walking and more for almost 30 years. RTC’s goal is to preserve important transportation corridors for public use, and encourage healthy activities while beautifying America to ensure a better future for our children. The Online Media Manager at RTC, Brian Gerhardstein, was hired in 2013 to help redevelop the digital strategy and website. His focus: getting visitors to engage around membership and development goals and ultimately get involved in creating new trails in their community. In an effort to help increase engagement and highlight new initiatives on the website, RTC needed tools that allowed them to market more effectively to both new and returning visitors. While they had effective channels for driving traffic to the site, they needed a way to convert visitors and then continue to engage them when they returned for future visits. Since Brian works with a limited budget, it was very important for him to find a cost-effective solution. Brian came across AddThis while researching different mobile-friendly website marketing tools for the site redesign. He was impressed with the way AddThis offerings could be customized to match their website, and he was excited about the ability to run smarter marketing campaigns at a budget-friendly price point. Sharing buttons: Easily allowing visitors on the site to share an article on their Facebook, Twitter, email or other on desktop and mobile. Audience Targeting Tools: Highlighting specific campaigns or promotions they are running on the site in order to collect email addresses, donations and pledges. 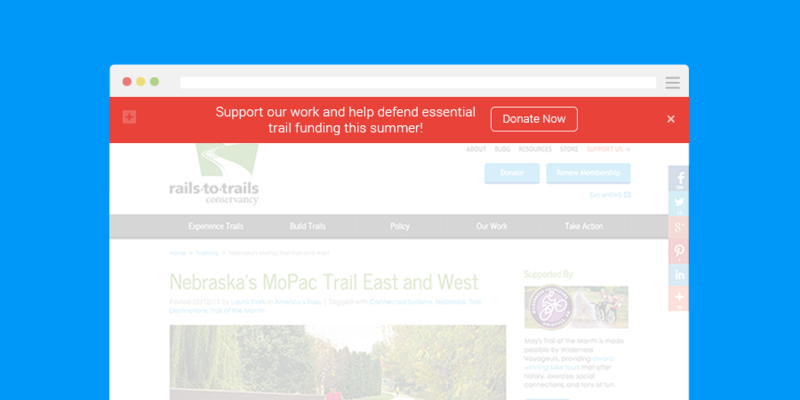 Follow buttons: Allowing them to engage with users off domain and deliver updates to engaged visitors and activists. In March 2015, RTC ran a campaign around its third annual Opening Day for Trails, which encourages people to kick off the beginning of the trail season by getting out on a local trail on the last Saturday in March. RTC held a contest in collaboration with REI, Clif Bar, Yakima and Camelbak to encourage visitors to pledge involvement on Opening Day. Visitors who pledged participation were entered in a drawing to win prizes from campaign partners. Brian and his team needed a way to promote the campaign. Brian’s team used the welcome bar to promote the campaign to all visitors, encouraging pledges by offering prizes. To target known visitors coming from email campaigns, they showed the overlay with a slightly different message. In total, they collected more than 19,000 email addresses and pledges, which helped increase campaign performance 300% over 2014. Learn more about the website marketing tools Brian used and how you can better convert your visitors with AddThis Audience Targeting.